This is a collaboration project with the popular virtual singer “Hatsune Miku” and FamilyMart. “Hatsune Miku Culture” refers to a movement where creators and fans create characters on online. According to this culture, the project is organized with participants from the public. 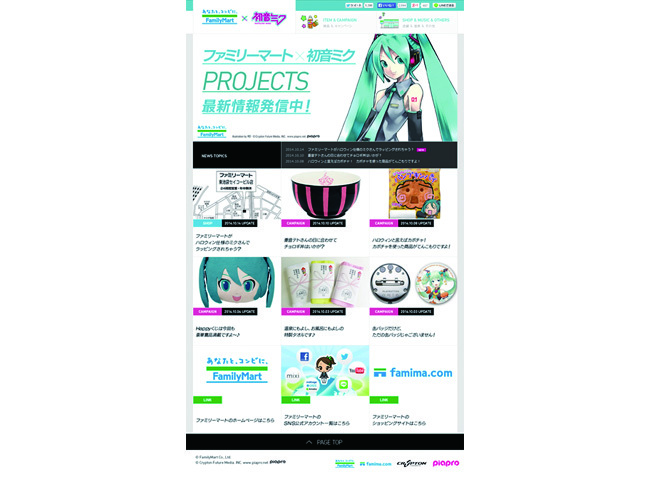 Especially the in-store campaigns including “Miku LOVES FamilyMart” are very well received, and the 6th campaign was held in the autumn of 2014. We produce the collaboration project “Hatsune Miku” and FamilyMart. With Crypton Future Media, Inc. that created Hatsune Miku, we plan campaigns and develop new products. We also organize PR activities and sales promotions on Niconico Live and on a special website. In the project, “Creating Hatsune Miku together”, we received illustrations and new menu ideas from fans. This collaboration project is continuing in the long term with the support of many fans and creators.